Debs: Errol was doing perk-related stuff tonight, and I’ve been wanting to do this comic for ages! I learned really quickly while traveling that the term “geek band” does not compute for many. These are actually some of the responses I got, no fooling. It wasn’t all bad though. The kids (and dad) at the PEI farm I stayed at were super into board games and Lord of the Rings. In Cape Breton, my hosts had recently finished watching BSG and the folks in New Brunswick are now completely addicted to Game of Thrones. I’m pretty proud of that one. 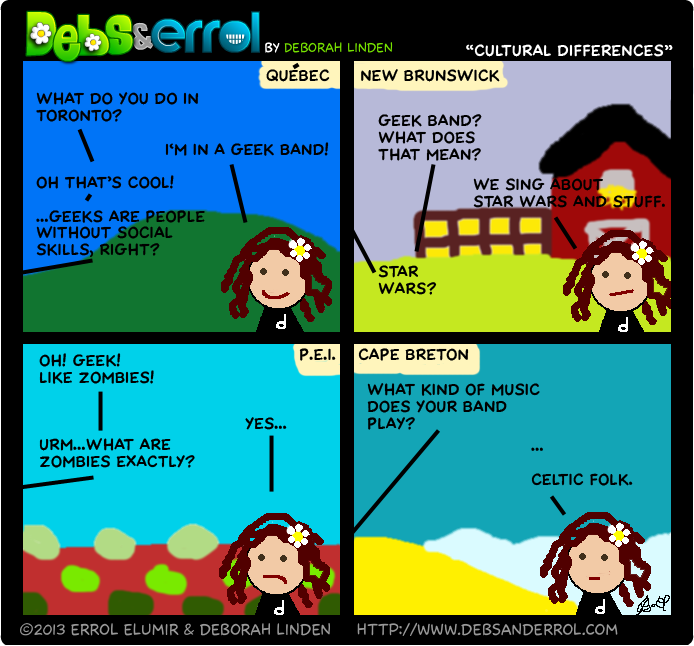 I used to get the ‘blank stare of utter confusion’ even among my geek friends whenever I would mention filk music. I even had one person try very determinedly to convince me that no, I meant folk. Now, thanks to many mixed cds, impromptu burstings into song, and dragging friends to conventions, they are all very well-versed in said musical stylings. During one recent roleplay session, my DM even dived into the chorus of March of Cambreadth. I was so proud. Very awesome! I’ve been into Filk since before I knew the term.